Piazza Navona is an extraordinary urban expression of the Roman Baroque, but with an overall layout dating from the time of the ancient Stadium of Domitian (81-96 AD). The stadium, considered one of the most important structures of its era, was probably still in use as Rome entered decline, in the 5th century. Later, among the arches of the ruined structure there arose small churches dedicated to saints Catherine and Agnes. Tradition has it that Agnes was still a child when she was martyred at this very place. In 1123, Pope Callistus II enlarged and transformed the original oratory of Saint Agnes as a small basilica, installing the main entrance in what is now Via dell’Anima and the apse towards campus Agonis, the vast floor of the now vanished stadium. 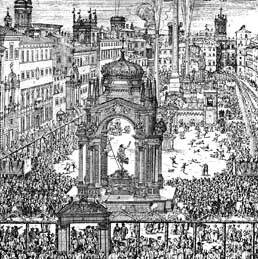 The term ‘Campo Agone’ survived as the name of the former arena floor, and in the wording ‒ Sant’Agnese ‘in Agone’. In the Medieval, the Campo continued to host games, races and knightly tournaments, while over time, noble families concentrated their residences to the south and west of the piazza. In the mid-14th century a branch of the Pamphili family moved from Gubbio to Rome and bought a small residence in Via dell’Anima, near the Campo. To this they gradually annexed further structures, developing the whole as the family’s townhouse, or palazzo. In 1644, Giovanni Battista Pamphili was elected pope, taking the name Innocent X. He immediately undertook construction of a more imposing palazzo directly on the piazza, which he also adorned with a grandiose fountain designed by Gian Lorenzo Bernini. Soon after, in 1651, Innocent X decided to erect a new church, subject to Pamphili family patronage and where he himself would be entombed. 12:15 p.m. and 7:00 p.m. Copyright © 2019 . All Rights Reserved .